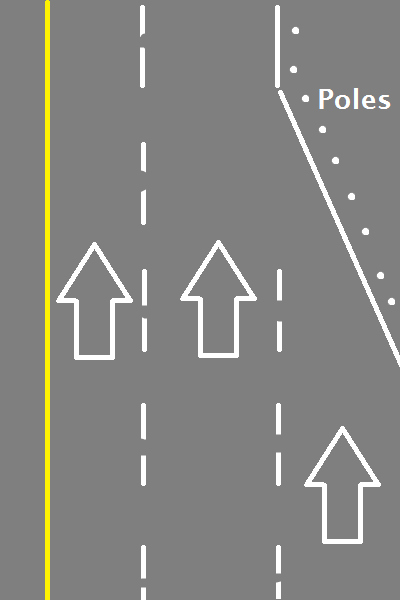 Why do merge lanes confuse people? | Why you drive bad?! Why do merge lanes confuse people? So we’ve all encountered merge lanes like the one in the image. This particular road, however, has metal poles to force you to merge. There are clearly marked signs saying the right lane ends and to merge left. I’m normally traveling in the middle through lane and I see some jerk in the right lane not merging even though they have plenty of space. They decide to ride out the right lane as if they were challenging the poles to move and give up when they see that the poles are NOT MOVING! No tap of the brakes or anything, just a swift move to the left (without signaling) without batting an eye. I always leave a gap while I’m in the middle lane just because of idiots like this. I’ve seen people get forced out of the middle lane when the right-lane idiots move over. They had plenty of time and space to make their move. I understand not merging because you’re scared to do so, but why ride out the lane and challenge another solid object? It’s not like there wasn’t enough room or time to do so. I guess texting your BFF Jill and chugging a venti carmel macchiato soy latte and calming the snot twins in the backseat is much more important than the menial task of driving. One of these days when I have a pre-owned Crown Vic Police Interceptor you will feel my wrath people! This entry was posted on Friday, March 4th, 2011 at 9:44 pm	and tagged with careless, driving, merge, timing and posted in bad driving. You can follow any responses to this entry through the RSS 2.0 feed.